I have been doing needlepoint for many years, at first I would do it on the cloth, but had so much trouble getting the completed cloth in the correct shape for framing I decided to use the plastic, which of course keeps its shape. I have done many wedding announcements. Upon receipt of the invitation I glean the facts which I think may be important and create the needlepoint work. Always buy the frame before you start, this will give you the size to work towards, and chose colours of the frame and the work that compliment each other. The most difficult part I find is creating the work on graph paper, working from the centre out, so that everything fits in nicely. These make fantastic gifts, I have seen many a tear when I hand this to a couple. 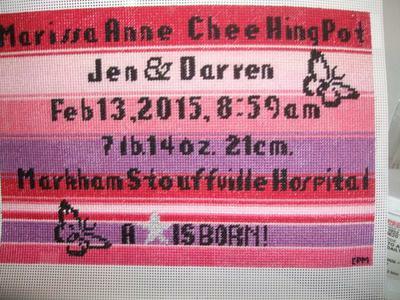 I am showing you a birth announcement, as you can see Marrisa was given several names one needs to be careful it all fits on one line, sometime change the size of the font, I have lately been creating birthday cards for each one of my Sisters, which I will post at a later date. Here are two of my birthday cards, I bought a card that holds the greeting + envelopes and once completed, the needlepoint fits into the card frame, and a wonderful heavy duty envelope that comes with the package makes this a very special birthday card. As it is not a enormous undertaking I can do it in one night. Background: again, I decide on the colour scheme ahead of time. 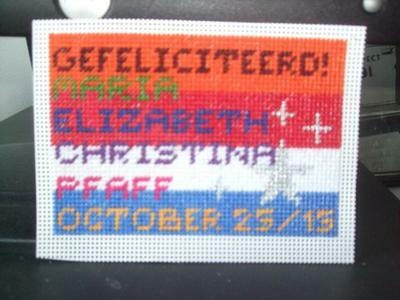 The one with the orange, red, white and blue stripes (you need to figure out which colours you want to use for the letters, so they are visible in the particular coloured stripe), is for a cousin in the Netherlands. The colours are Orange for the house of orange, red white and blue, are the colours of the flag of the Netherlands. The one with pink background is for a sister, who;s colors are simply pink from my perspective. Thank you for sharing your needlepoint pieces, Neil. I have combined both your posts into one, so all the information is together. I very much like your creativity with these. I can imagine the delight when you present them to the lucky new owners.